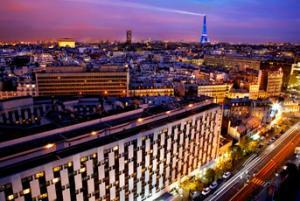 Set on Paris’s “Rive Droite” (“right bank”) of the Seine, Le Méridien Etoile is steps away from the legendary Champs-Elysées. Many of the most celebrated sights in this luminous city are within easy access: the Luxor Obelisk in the Place de la Concorde, the Arc de Triomphe, the Louvre and Orsay museums, among others.Le Méridien Etoile is opposite the Palais des Congrès, and business travelers can reach the business district of the city, La Défense, by way of the Porte Maillot metro station one minute away. The 2,500-square meter meeting and conference centre can accommodate up to 1,200 people. 25 elegant and multi-purpose lounges can also accommodate any event, from a small business meeting to a large conference.Discover a whole new way to navigate the world in one of the new forward-thinking Executive guest rooms.Le Méridien Etoile’s Jazz Club, Etoile, has become one of the most distinguished institutions in Paris for jazz lovers, hosting some of the world’s best musicians. Le Méridien Etoile’s conference and banqueting facilities provide 25 conference rooms with more than 2,500 square meters of meeting space. All meeting rooms are equipped with the latest audiovisual and communication technologies including Wi-Fi. The elegant décor of the rooms combined with their functionality make them the perfect place for your seminars as well as your receptions.Two new spacious rooms provide an even greater selection for your convenience. Those two multi-purpose and modular meeting spaces, respectively representing an area of 661 and 484 square meters, can host events of up to 1,200 people. Press conferences, gala dinners, or product launches – the choice is yours, the expertise is ours.All nine state-of-the-art conference rooms in the Espace des Philosophes are dedicated to executive meetings. The Espace Longchamp provides three meeting rooms perched on the edge of the lush and beautiful interior garden of the hotel.If your associates are jazz lovers, reserve the Jazz Club Etoile for a private soiree and entertain your clients in style as you unwind after a busy day.